check our other listings for other 75-1983 maico kits. all socket allen kit, kit isn't just a bag of bolts, comes sorted with easy instructions! 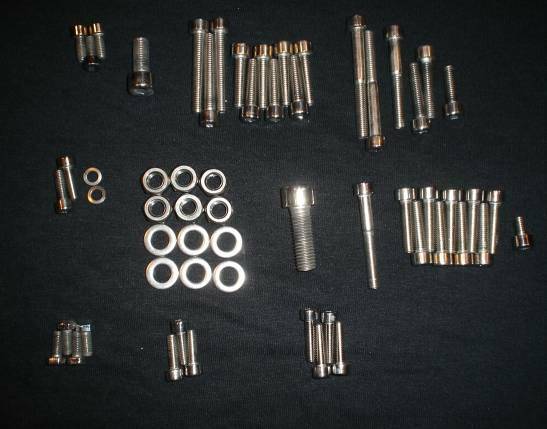 kit includes socket allen bolts, flat washers, lockwashers, and nuts - all parts are a2 or a4 stainless. socket allen heads have no knurls, and shine very nice. here's a pic of a similar kit. Item Description WE BUILD ALL KITS TO ORDER. OUR PRODUCTION TIME IS 3-5 BUSINESS DAYS. SOMETIMES FASTER! SOMETIMES SLOWER (ESPECIALLY DURING THE SUMMER MONTHS!!) we polish all fasteners by hand, literally thousands of fasteners a day, this takes time. we are working as fast as we can. if you are not willing to wait 3-5 business days for your order to ship, don't purchase. or plan ahead. Sellers: Get your own map today. Click here now. Simple. International shipping: we ship via usps priority international flat rate envelopes and small boxes. Online Tracking - Put our delivery information to work for you. Track PMI package shipments. Note: Tracking is not available for Priority Mail International Flat Rate Envelopes or Priority Mail International Small Flat Rate Boxes. usps only offers delivery confirmation on these packages, not tracking progress.